Fig. 1 - Coraline (Henry Selick, 2009). Fig. 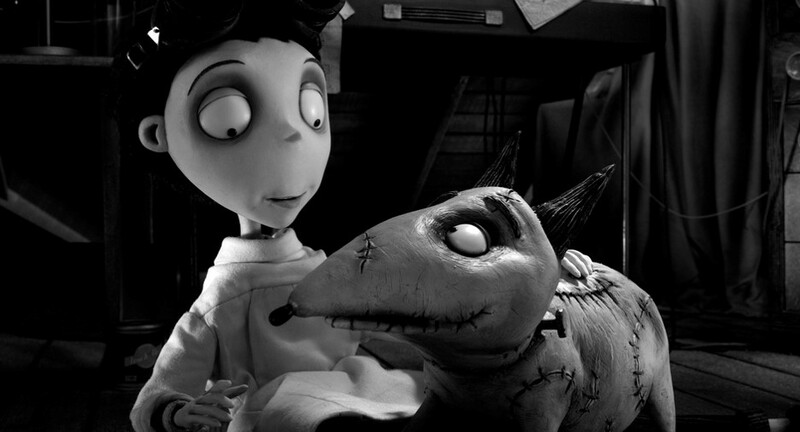 2 - Frankenweenie (Tim Burton, 2012). Fantasy and animation, especially when combined, are often associated within popular discourse with children’s media. Referring predominantly to stop-motion animation, this post offers some thoughts on what the intrinsic association between children, fantasy and animation might mean in the context of another genre that has a more problematic relationship with child audiences: horror. Although horror is rarely considered a children’s genre, horror films addressed to children do exist, and across various forms of animation and live-action: the stop-motion animated Frankenweenie (Tim Burton, 2012), CG-animated Monster House (Gil Kenan, 2006), or the live-action Hocus Pocus (Kenny Ortega, 1993). As I have noted elsewhere, children’s horror films face a dilemma in that “the very things that make horror ‘horrifying’ must be excluded, or significantly lessened, in order for these films to remain ‘child-friendly’” (Lester 2016: 22). These ‘things’ are namely depictions of gore and violence, especially those which seem realistic in nature. Due to this need for the ‘horror’ in children’s horror films to be distanced from reality, fantasy and animation tend to be considered mitigating factors in managing this exclusion. This is evident from the BBFC’s guidelines for the PG rating (the most common rating for children’s horror films), which name fantasy as a distancing strategy that can lessen the effect of threat and violence. Animation is also cited by the BBFC as being able to lessen the effect of horrific imagery in children’s films such as in another recent stop-motion feature, Coraline (Henry Selick, 2009). The reasoning is understandable: for many fantasy scholars, fantasy is often considered as offering “a world divorced from our own” (Walters 2011: 6), and animation, similarly, marks an aesthetic distance from reality. When combined, they can help to signal films (as in the case of Monster House, Coraline and Frankenweenie) with potentially frightening imagery as not real, and therefore of no danger to child viewers. This logic is echoed by the BBFC, who say of Coraline that its “fantastical elements […] plus the fact that Coraline features animated models rather than human actors, all make it very clear that Coraline’s world is very different from the real world of the [presumed child] audience.” On the other hand, there is evidence that this thinking about the role of fantasy and animation is somewhat misguided. Coraline’s PG classification remains contentious, with the BBFC regularly receiving complaints from the parents of scared children. This film, and a number of other animated and/or fantasy films, regularly feature on lists of “Scariest Moments in Kids Films” that appear online, such as one example on RollingStone.com. Nearly all of the 12 films listed, including The Wizard of Oz (Victor Fleming, 1939), Fantasia (various, 1940) and Harry Potter and the Goblet of Fire (Mike Newell, 2005), operate in a fantastical context, and are either animated or live-action with animated effects. Interestingly, within the latter category, the animated effects are the source of the horror. Take the “Large Marge” sequence from Pee-wee’s Big Adventure (Tim Burton, 1985) in which Marge, the ghost of a deceased truck driver, briefly transforms into a bug-eyed monstrosity. What makes this moment frightening is arguably not just that it is unexpected, but that it marks a sudden formal and generic shift. Animation and the fantastic rupture the live-action cinema and cheerful surrealist mode that dominates the rest of the film. Also notable about this moment is that Marge’s transformation is presented in stop-motion animation (a medium that is increasingly common for producing children’s horror films, such as those produced by Tim Burton and Laika Studios). Stop-motion requires models to be moved in tiny increments by hand, and photographed frame-by-frame, to achieve the illusion of movement when the images are played sequentially at 24FPS. The fiddly, painstaking and time-consuming nature of the process means that it is difficult to “recreate an absolutely realistic sense of movement” (Furniss 1998: 165). Stop-motion characters therefore often have a jerky, unnatural sense of movement, which in the case of Large Marge can make an already frightening face even more disturbing. What makes this moment frightening is arguably not just that it is unexpected, but that it marks a sudden formal and generic shift. Animation and the fantastic rupture the live-action cinema and cheerful surrealist mode that dominates the rest of the film. Also notable about this moment is that Marge’s transformation is presented in stop-motion animation (a medium that is increasingly common for producing children’s horror films, such as those produced by Tim Burton and Laika Studios). Stop-motion requires models to be moved in tiny increments by hand, and photographed frame-by-frame, to achieve the illusion of movement when the images are played sequentially at 24FPS. The fiddly, painstaking and time-consuming nature of the process means that it is difficult to “recreate an absolutely realistic sense of movement” (Furniss 1998: 165). Stop-motion characters therefore often have a jerky, unnatural sense of movement, which in the case of Large Marge can make an already frightening face even more disturbing. This unnerving quality of stop-motion is also present in Coraline. As the film is entirely stop-motion animated, it does not contain a similar sudden ‘rupture’ of reality to that of Pee-wee. Rather, the film’s subtle blurring of the boundary between the fantastic and the horrific, combined with the use of stop-motion animation, achieves the film’s chilling atmosphere. Coraline’s eponymous protagonist is a bored girl who discovers a portal in her home to a parallel world, identical to her own but for that it is far more appealing than reality and populated with fantastical delights including toys, pictures, and even food that comes to life specifically to please her (see below). The eponymous Coraline meets her Other Mother and Other Father. Rachel Moseley (2016) takes issue with the automatic acceptance of stop-motion as uncanny, and argues that in certain contexts – such as children’s television programmes made by the Smallfilms studio – it evokes enchantment and delight rather than fear. Indeed, we can see this at work in the above clip. A dual layer of enchantment is created as Coraline’s wonder at the animated toys is mirrored by that of the (child) audience who are invited to marvel at the stop-motion animation bringing life to inanimate objects. But as the film itself shifts into the mode of horror, and the animated toys and plants turn against Coraline, so too does the effect of stop-motion turn from delightful to disturbing. This effect is enhanced when it is revealed later in the film that even the people who populate the other world are automatons created to do the bidding the Other Mother. As objects forced to move against their own will, they are an eerie reflection of the medium of stop-motion itself. Coraline therefore illustrates how fantasy and animation are often taken for granted as being able to alleviate horrific imagery, when in fact they may have the opposite function. This reveals the subversive potential of combining fantasy and animation and its ability to evoke fear in thrill-seeking child viewers beneath the guise of ‘children’s’ media, modes and genres. “PG.” British Board of Film Classification, accessed June 29, 2018, http://www.bbfc.co.uk/what-classification/pg. “Coraline.” British Board of Film Classification, accessed June 29, 2018, https://www.bbfc.co.uk/case-studies/coraline. Ehrlich, David. “12 Scariest Moments in Kids’ Films,” Rolling Stone (October 19, 2015), accessed June 29, 2018, http://www.rollingstone.com/movies/lists/12-scariest-moments-in-kids-films-20151019. Furniss, Maureen. Art in Motion: Animation Aesthetic (East Barnet: John Libbey and Company, 1998). Lester, Catherine. “The Children’s Horror Film: characterizing an ‘impossible’ subgenre,” The Velvet Light Trap 78 (2016): 22-37. Moseley, Rachel. Hand-Made Television: Stop-Frame Animation for Children in Britain, 1961-74 (Basingstoke: Palgrave Macmillan, 2016). Walters, James. Fantasy Film: A Critical Introduction (Oxford and New York: Berg, 2011). Catherine Lester is transitioning between the University of Warwick, where she completed her PhD, and the University of Birmingham, where she is to take up the post of Lecturer in Film and/or Television from September 2018. Her research interests focus primarily on children’s media, the horror genre, and the intersections between them. Her monograph on this subject, entitled Horror Films for Children: Fear and Pleasure in American Film, is forthcoming with I.B. Tauris. She is also organising the upcoming symposium The Legacy of Watership Down: Animals, Adaptation, Animation.